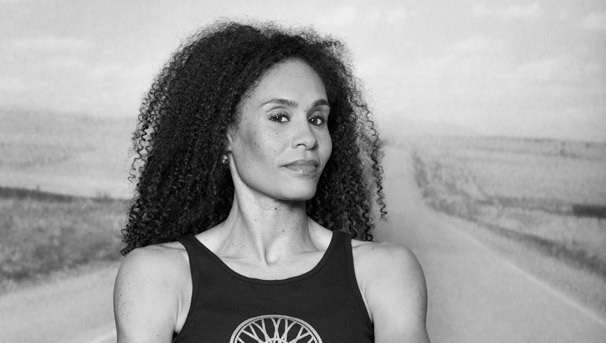 Fitness trainer and inspirational "Soul Cycle" coach Angela Davis is making her first appearance on "The Talk" to share exercises for a stationary bike that result in a full-body workout. "Soul Cycle" is a dynamic and popular cardio program set to candlelight and music that aims to strengthen the body and mind. First off, you need to know that there are three hand positions that you need to hold on to within your handle bar. In position number one, grab your handle bars nearest to your body. In position number two, grab the middle part of your handle bar. In position number three, grab the handle bar area that is farthest from your body. Start peddling your bike! Rise out of the saddle to position three and continue to pedal to the beat of the music. Contract the abdominals, while extending the body back towards the saddle. Release back to starting position. Continue to "tap it back" to the rhythm of the music. This works out your lower body. Obliques are your group of muscles that are located on the sides of the body above the waist. This is how you do the work out... Continue to peddle. With hands in position two, bend at the side to bring your right elbow to your right knee. Obliques should be engaged. Press back up and repeat on the left side - bend at the side to bring your left elbow to your left knee. Continue to the rhythm of the music. This is a great way to get rid of those stubborn "love handles." Triceps Dips: Begin seated in the saddle with hands in position one. Bend at the elbows and lower the chest down towards your thighs. Engage the triceps and press back up. Continue to peddle to the rhythm of the music. Push-ups: Stay out of the saddle, but move the hands to position number two, core should be engaged to stabilize. Bend at the elbows and lower your chest towards the bar in a push-up position. Press back up to starting position. Continue to press and push to the rhythm of the music. This works your upper body. Towel Lifts: Continue to move your legs with the resistance high. Contract your abs. Hold the towel taut between your arms. Slowly raise your arms up and then down. Repeat eight times. Towel Twists: Next, with your arms out, holding the towel, twist from side to side working your arms, back, shoulders and core. Continue to peddle on the bike. Grab your hand weights from the bottom of your saddle. Choose your weights accordingly… They vary from one pound to five pounds. Criss cross the hand weights in front of you and pull them back into a row. This move works out your arms and back. It's called the Dip into Clap. Move your legs and peddle your bike, increase your speed and dip down and sit up, holding in your core to clap. This is great for working your abs and arms. ​First Look At The Twilight Zone's "The Wunderkind"